A few days before my sem break ends, my best potatoes friends asked me out on a KL trip. 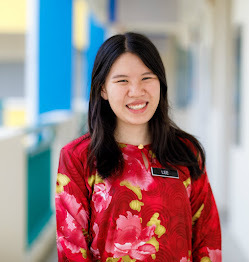 We planned to go to KLCC because it was the easiest place to access via trains. As usual, I googled and did my homework on some good onomnomnoms over there and I realized that the famous Acme Bar & Coffee is located just next to KLCC's park! Feeling adventurous, I suggested it to my friends and they happily complied. We walked there from KLCC under the hot sweltering sun, and oh boy, walking with an empty stomach really made the whole stretch of road felt so long! 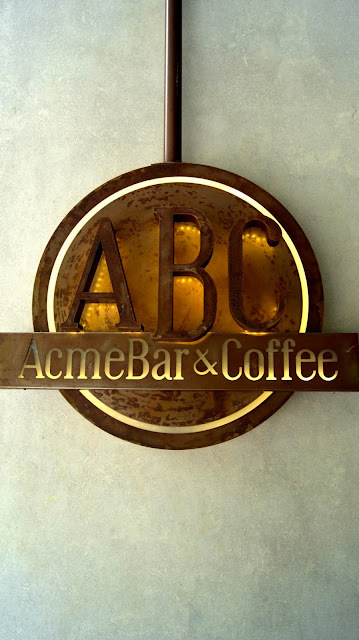 A wave of excitation ran over me, when we finally arrived at Acme Bar & Coffee (ABC), located in The Troika along Jalan Binjai. We pushed the heavy semi-opaque glass door open,to be greeted with an elegant sight. Classic black & white tile, black walls, contemporary designed furniture, vintage decorations on shelves, high ceilings that makes the place feel so spacious, and french windows, stretching from the floor to the ceiling, allowing ample sunlight to glitter through. 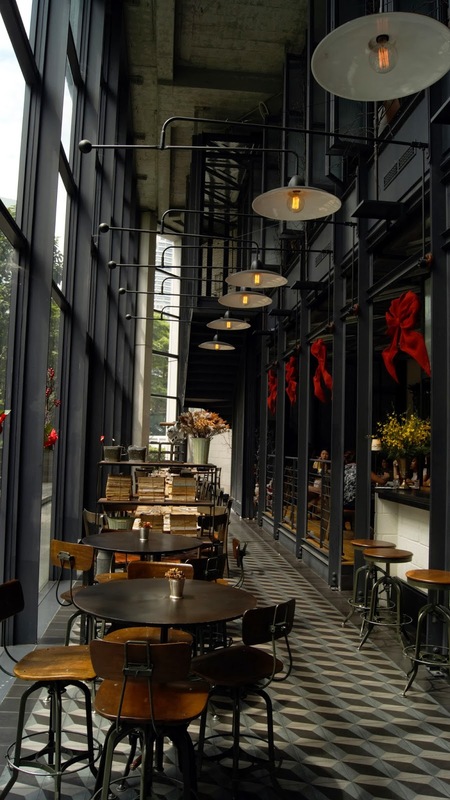 I immediately felt in love with the chic, modern & elegant interior. 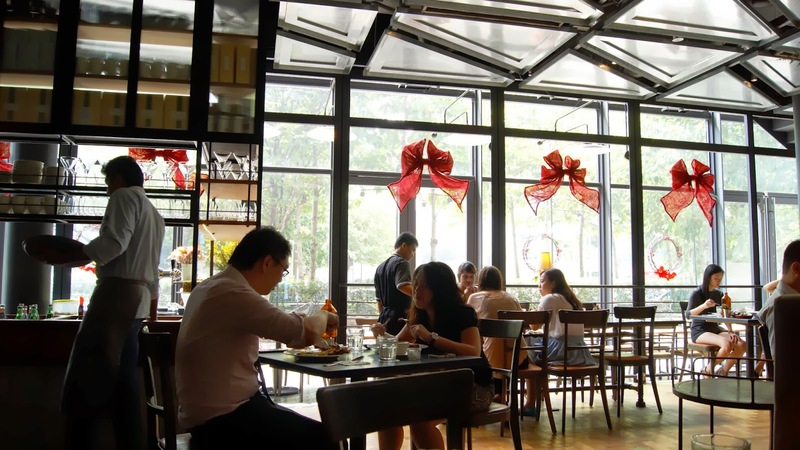 The elegant backdrop certainly made ABC a perfect place for those who yearns for a nice place to spend a lazy afternoon. We were ushered to a dark & cosy corner of the restaurant by the waiters. We requested to have our meal by the french windows (for a better lighting for the cameras) but unfortunately, that whole area was booked! Was quite taken aback as it was a normal weekday afternoon on the day of our visit. 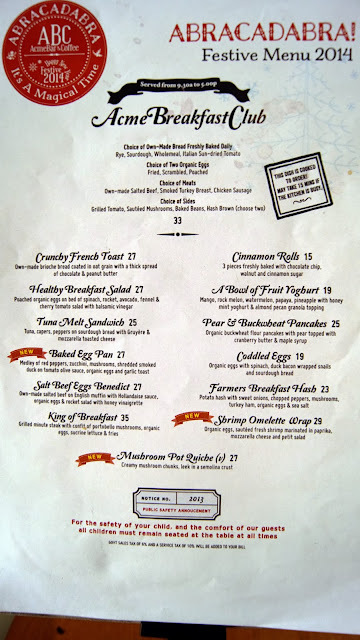 ABC's glorious breakfast menu- I got pretty excited as I ran through the menu only to be left disappointed when the waiter told us that the breakfast menu is only available on weekends! So we had to order from the festive menu which was equally as impressive too. We were really spoilt for choice! You can browse through their menu in the website HERE. A polenta base pizza, topped with Duck Chorizo, Mushrooms, Jalepeno and finished off with a mixture of Gyuyere & Mozarella Cheese. When the pizza arrived, the first thing that crossed my mind was "this isn't messy at all!". It starts to get messy when you dig in. ABC was really generous with their toppings so the duck chorizo started tumbling down as we dug in. 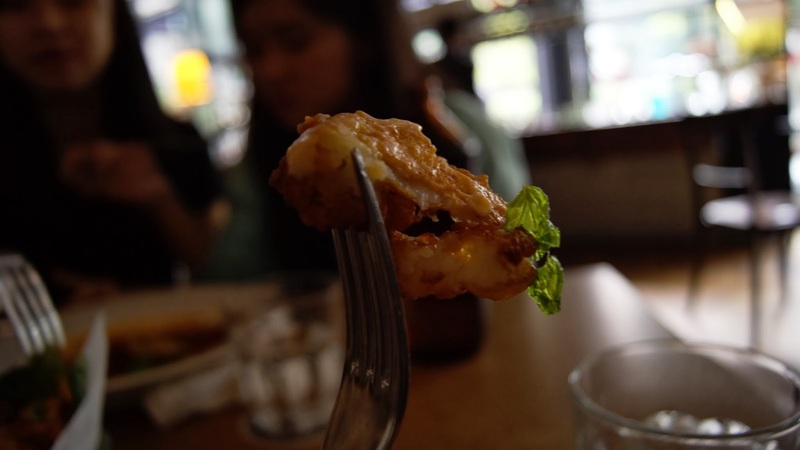 The mixture of gyuyure & mozarella cheese was really rich, and a delight to the taste bud. The duck chorizo was simply tender and juicy, and complements the rich cheese so perfectly. I didn't really fancy the polenta crust though. Felt that the crust needs a little more "crunch" to it. I must admit, that this is the most expensive bowl of soup I'd ever had. 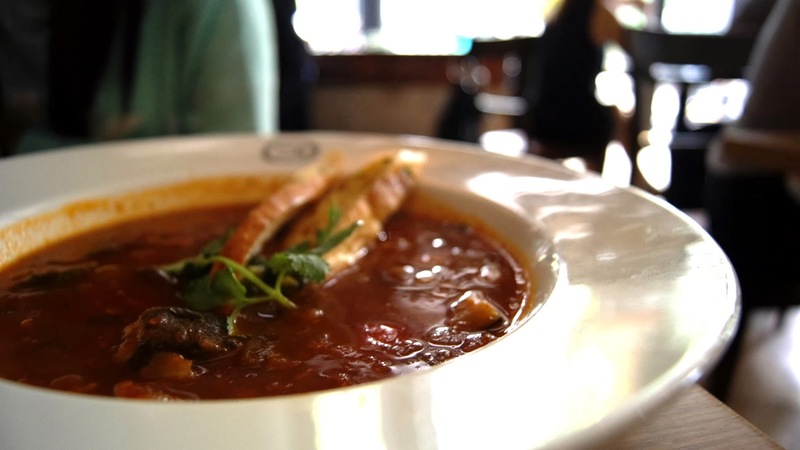 The soup was thick, hearty & rich. Each spoonful had a generous chunks of vegetables. 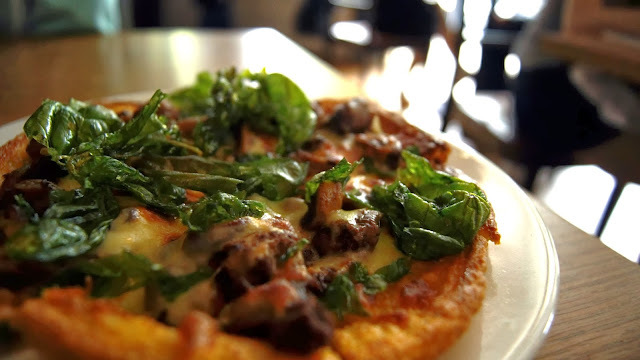 It was definitely delightful for the stomach, but not-so-delirious to our wallet. I truly enjoyed this dish till the last drop, but honestly think that the price we paid was a little too steep. Deep Fried Mashed Potatoes Ball, coated in a crunchy layer of tenpura skin. Served with a side of spicy mayo sauce. 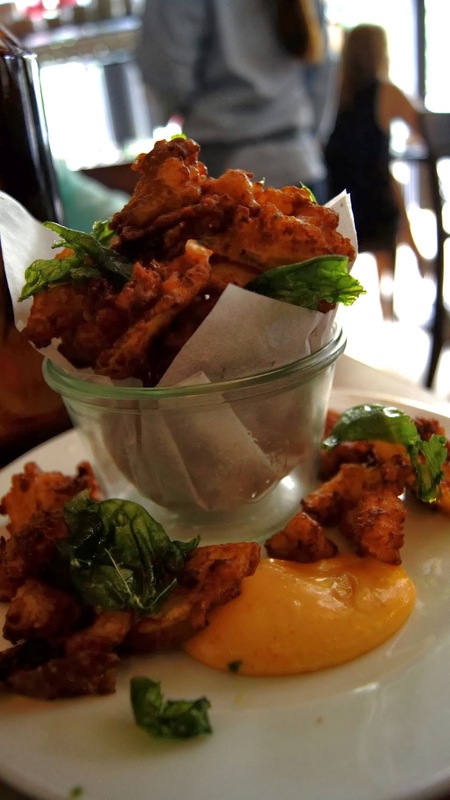 The patate fritte were really addictive- crunchy on the outside, smooth & soft in the inside. The crunchy skin has a distinctive taste which was enhanced with the presence of the leaf-herbs-thingy (still wondering what spices was it hmm). The tangy & spicy dipping sauce was a delight to the taste bud, sweet with a spicy aftertaste, and it complements the mini potato balls perfectly. However, it'd be so better if ABC hadn't skimp on the dipping sauce. We finished the addictive dipping sauce when we were halfway through the potatoes. 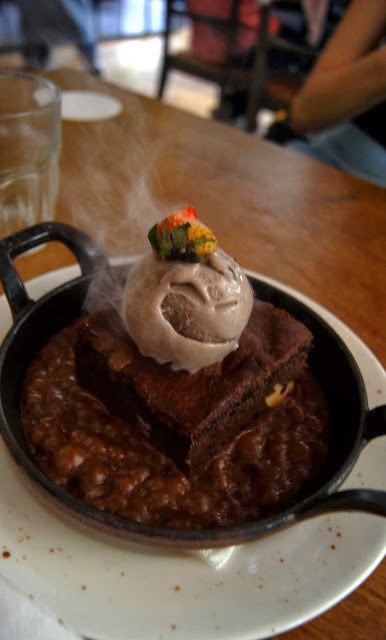 Brownie topped with Ice-Cream, sitting on a sizzling pot of chocolate sauce. 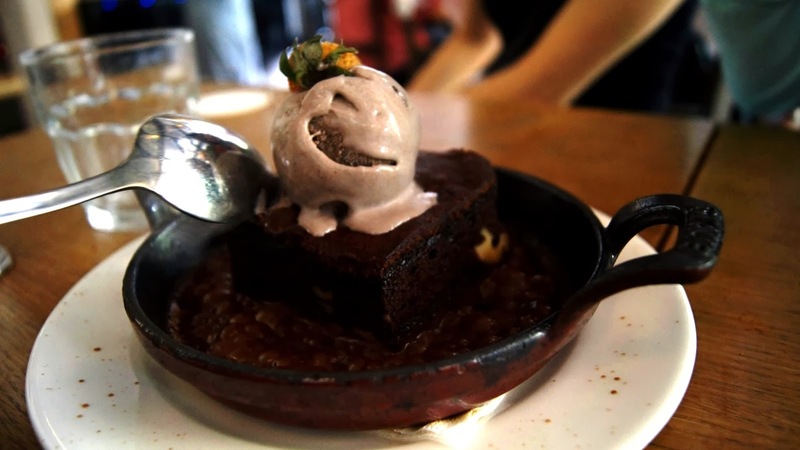 Paired up with the sizzling hot, rich, sinful yet so delightful chocolate sauce, and the cold, smooth, velvety ice-cream....The combination couldn't get any better. The downside is, you'll have to polish off this dish with lightning speed. The pool of chocolate sauce hardens up really fast. Digging the hardened chocolate stuck to the bottom of the pan is not really recommended as you'll taste an unpleasant burnt smell. I'd most likely be back, but only for their desserts. The price of the food here is a little too steep from what I could afford, and it wasn't really breathtakingly amazing. It was good- but it didn't really won my heart. Felt that the service there needs a bit of polishing. The waiters weren't so welcoming, especially when we told them we did not have any reservations.